Maybe it's like when you've eaten sweet things for the entire feature film and then all you want is salty and you down an entire bag of smoked almonds to balance out all the sugar. 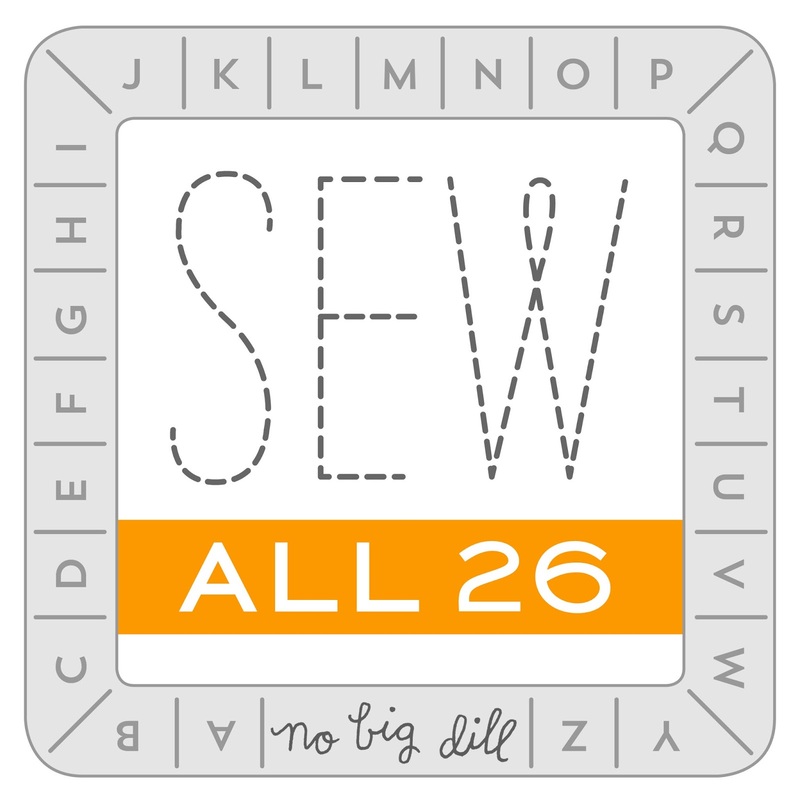 Sewing for five girls and I finally get the chance to sew for a boy: Bring on the salt! I have wanted to sew Drummer a little suit since the day (okay, maybe the day after) he was born. He might have a dozen ties already. I race to get him dressed Sunday, before anyone else gets a chance, because he's the new Barbie. A much chubbier, squishable version. 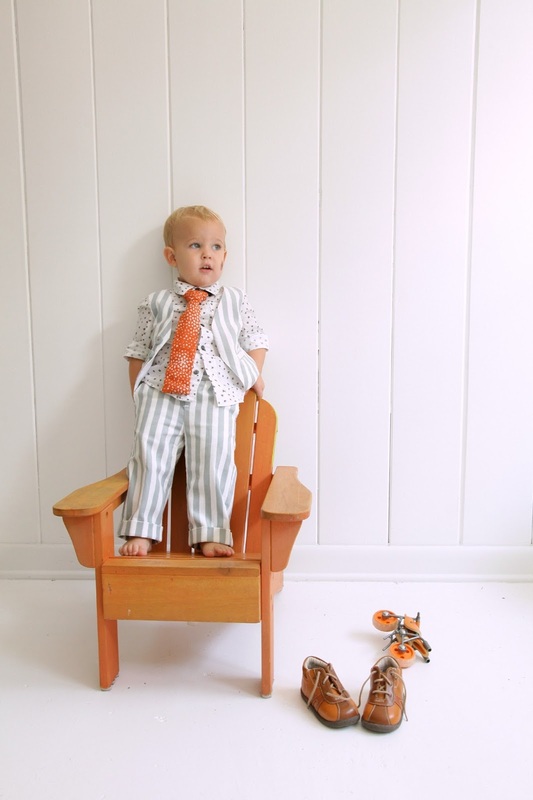 When Liesl shared the new Oliver + S fall patterns, I was so excited to see the Art Museum Vest and Trousers in the line up. Yes. This is what Drummer needed in his wardrobe. I cuffed the pants so he can hopefully wear them a bit longer, I'll just undo them and enjoy that corduroy stripy-ness as much as I can. And if you've been cowering from welt pockets, this is the pattern for you to face those fears. Take that pocket by it's welt and master it, because there are two on the vest and two on the pants. You will conquer it before the Museum closes and feel a strangely powerful sense of accomplishment. He is the most joyful creature to have with me all morning while the girls are at school. He will grab my hand and say "show me!" and pull me where he wants me to play, or help, or fix something. He animates his cars and asks "name?" to the others. He is so genuinely concerned with others and always wants to help and be ON my sewing bench with me when I sew. We lucked out with this kid, I tell you. As I was looking for buttons, I came across these FELT buttons I bought years ago in Korea. THE perfect shade, because, as it turns out, there are lots of shades of grey and they don't all look good together. I made the mouse run up the clock. His own little stopwatch. 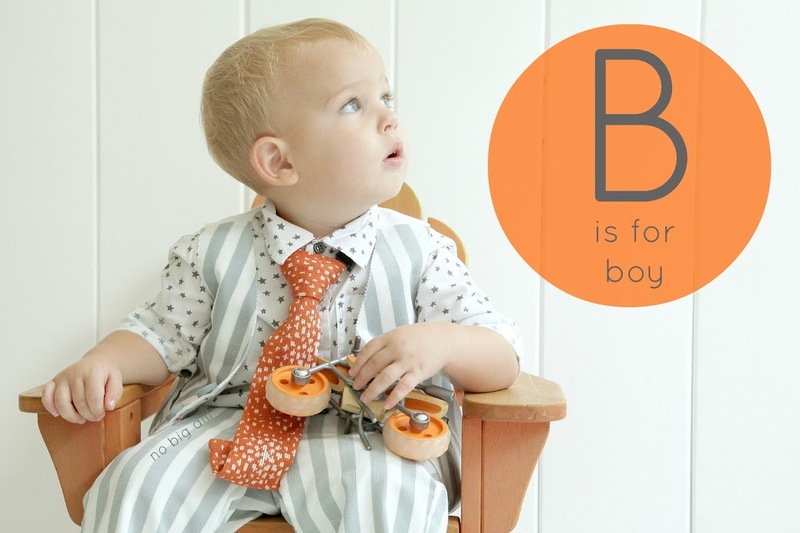 Another great pattern from Oliver + S. It just might be O for Oliver +S, S is for suit, V is for vest and all the other letters, too. Katy I love it! I've got to move over there so I can try claim dibs on hand me downs ;) lol. I love the whole look. Drummer looks like such a little boy all of a sudden. Sewing for boys is a blast. Gosh, he is absolutely adorable! 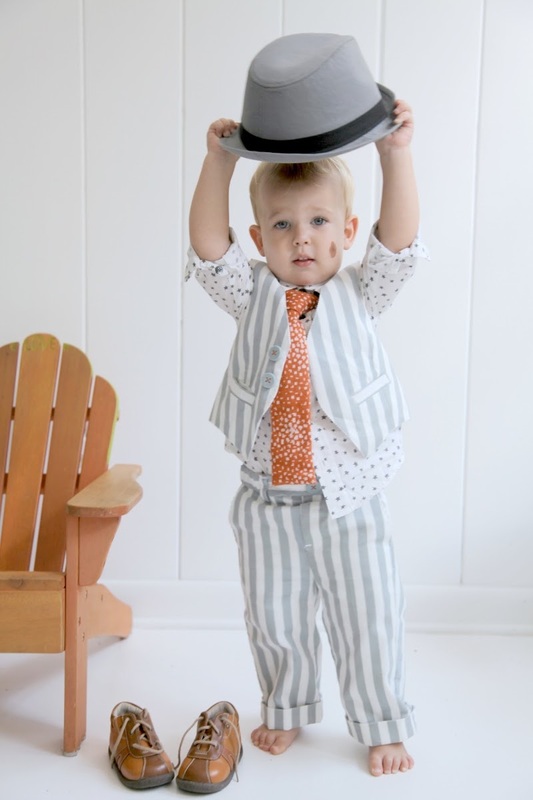 What a great little suit! Love this! Also, I kind of want to just come play at your house. It looks so fun all the time! So fun for you! He is as precious as all your other Dills in his own boy way. I love it! That suit is to die for! I am IN LOVE with the 'pocket watch' and the little mouse. What a cute little extra! That looks so so darling on him! 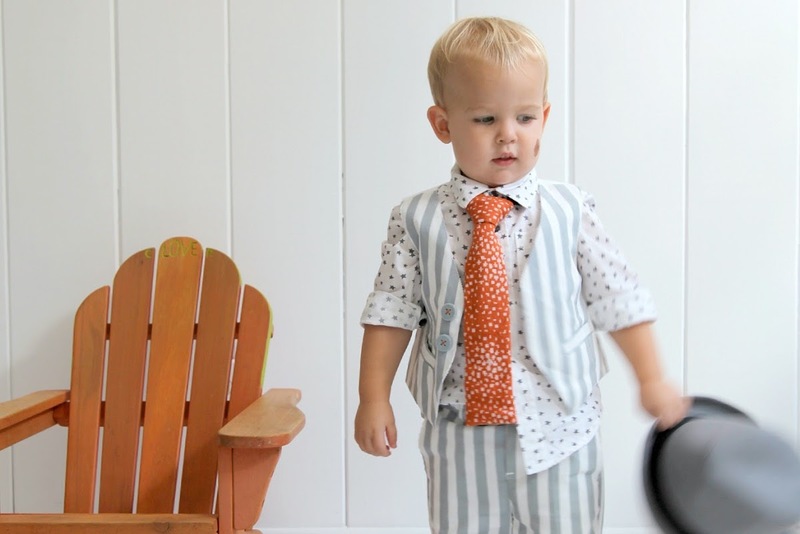 Dressing my son on Sundays is my favorite too. :) I love the idea of cuffing the pants to get more wear--I will remember that trick. I may just have to put this pattern on my wish list. Your details are always so fun---felt buttons, mouse and the clock...oh your kids have such a fun mom! The mouse and clock detail! Stop. It's too good. 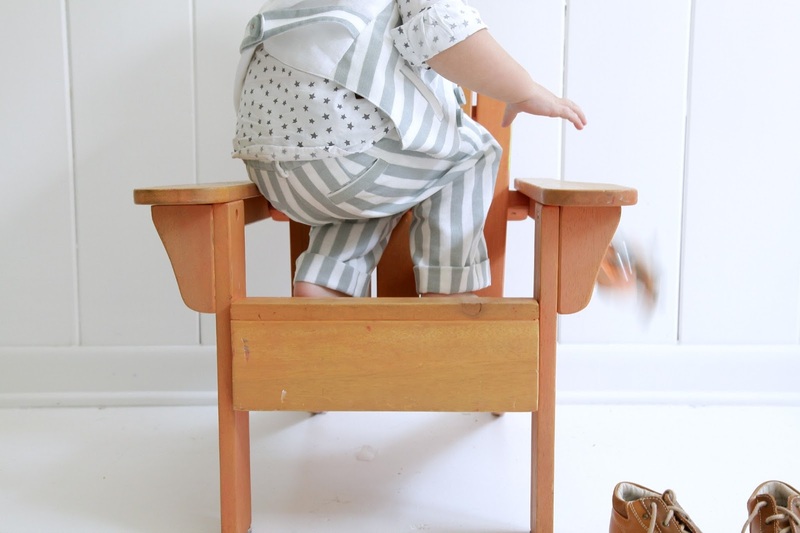 I love this so much and am so happy you get to sew for your little boy! 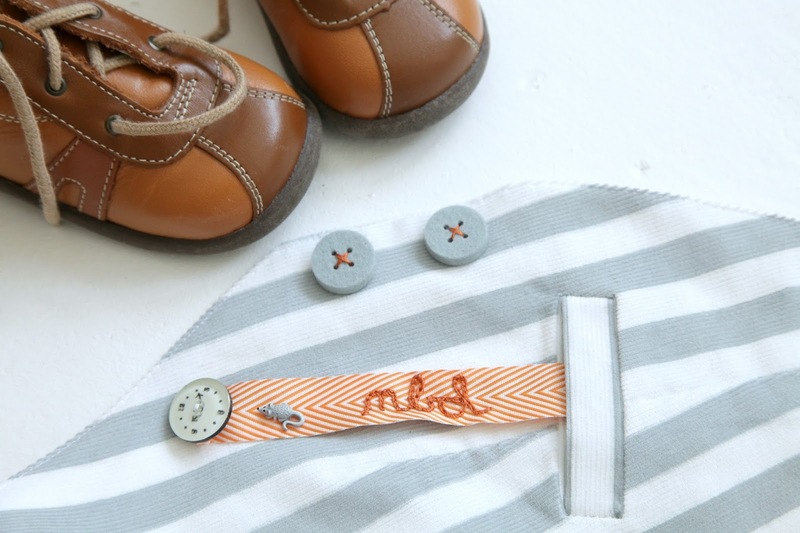 The stripes are perfect and you know that star shirt has my heart written all over it! I love all the little extra touches you add - truly inspired! It's a very gorgeous outfit, i really like the stripes with stars. Both are really simple but so eyecatching& the tiny pocket watch detail is lovely. Oh so very charming!! 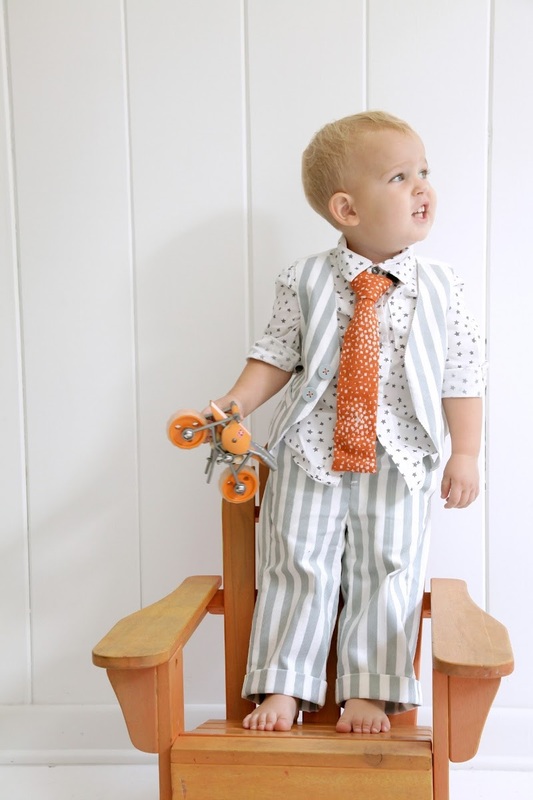 Drummer looks like so grown up in his special suit. You are the detail queen, Katy. I so admire your creativity! Love the striped fabric with the star fabric for the shirt. 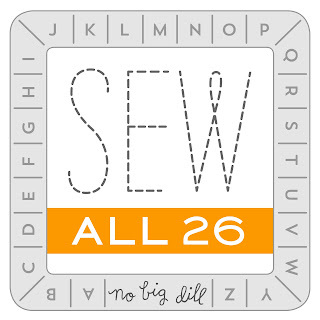 I have just completed a post for "A" and would love to add you Sew All 26 button to my blog. May I do that? I will link my "A" post to your A is for Arrow post. If I get a "B" post put together should I link it to the same spot or is there another link for the letter B? Thanks, Karen! Each letter will have a corresponding link-up for that week. The B link wasn't working, but I've tweaked it and it appears to be working now, so go ahead and add your B outfit. the vest & trousers turned our fantastic! I have the hardest time finding striped fabrics, you sure found a good one. Also fun posting the same pattern the same day! OH and I love your thoughts on sewing for a boy - it's waaaay more fun to dress mine than I expected, for sure! So, tell me why your clothes are not already on the market and you are making the big bucks???? Awesome, awesome stuff! haha! I need someone to invest in me? Also, glad you're still reading as I've wondered what you're up to these days. 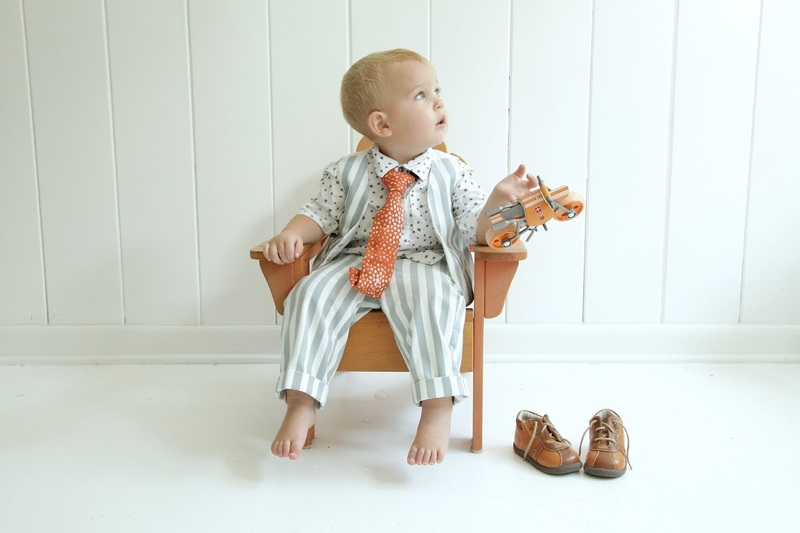 Have you ever thought of designing for your own children's line? Your ideas are remarkable! I agree with the 2 people above me, just adorable and Drummer, oh my goodness he's adorable! I'm not surprised that he is so special, he is surrounded by a house full of little girls, a mom loving on him... and that great dad too!